Tom Brady, left, and Roger Goodell. The judge who is hearing New England Patriots quarterback Tom Brady's appeal is ordering Brady and the NFL to engage in "good faith settlement efforts" ahead of a scheduled hearing on Wednesday morning. Judge Richard Berman filed an order on Tuesday morning requesting that both sides try to reach an agreement. 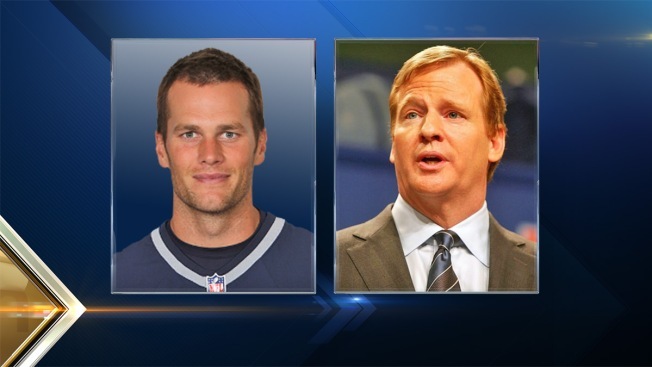 The judge will meet with Brady, NFL Commissioner Roger Goodell and attorneys for both sides at 10:30 a.m. Wednesday in New York City. Berman's motion said he will meet "briefly" with the parties for an "update" on their discussions. A second session is scheduled for Aug. 19. Brady wants his 4-game suspension overturned for his alleged role in the Deflategate controversy. A report commissioned by the league found that he was "generally aware" that team employees deflated footballs before last season's AFC title game. Brady and the Patriots open up their preseason schedule on Thursday against the Green Back Packers. Necn's Justin Michaels will be in New York City covering Wednesday's appearance in federal court. His live reports begin Tuesday at 4 p.m. Follow him on Twitter at @JMichaelsNews.